You're wondering on how to make portrait eyes follow you. Of the many articles covering photography portrait tips on this website, there's been an unintended shortcoming on the importance of eyes in your photos...until now that is. We were taught in photography school to "Focus on the eyes" but that didn't refer to just focusing properly to get a sharp photo of our subject. let's dive in first on the topic of how you can create a portrait where the eyes of the subject follow you no matter what angle you view it from. The answer is simple. Have your subject look directly at the lens. There's a long,scientific explanation of this phenomenon, but I'll condense. It's just the way our brain interprets our 3 dimension world from a 2 dimensional representation of it. 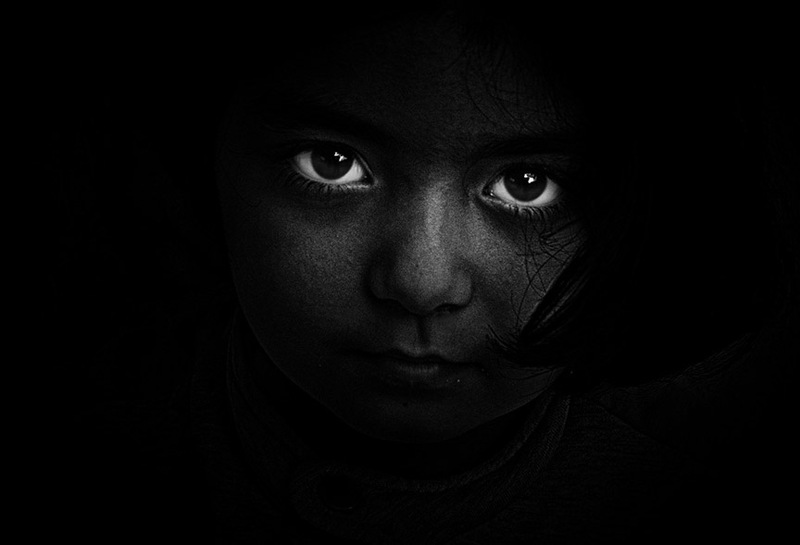 When considering how to photograph people, we must remember that our eyes are the windows to our soul. Let's face it, great portrait photography has to do with perspective, composition and portrait lighting techniques. All of my tradition portrait photography starts with getting sharp focused eyes. There are occasions when we may want to have some blur or lack of sharpness in the eyes, but that is a topic for another day. 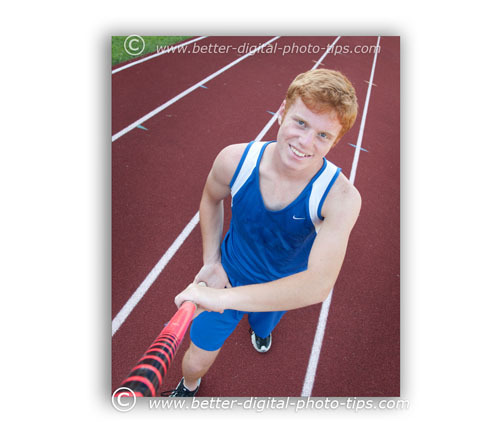 In the portrait of the pole vaulter above, I used diagonals to improve the composition. I climbed a small step stool, so that I could shoot down at my subject and have the lanes of the track as my background. His blue eyes are well it from the sky above and are accentuated because they match his shirt and contrast with the reddish track surface. I had him place the pole on my shoulder which creates another diagonal, a leading line that guides our eye into the portrait. This portrait is essentially a full body pose and his eyes are relatively small in the composition. In this portrait of young lady to the left, I placed her eyes near the intersection of those imaginary 1/3 vertical and horizontal lines. Unlike the photo above, I chose a large camera aperture to achieve a shallow depth of field and created an out-of-focus background. I chose a camera angle that would include the plants,flowers and landscape rocks to give the background some variety in texture and color. I emphasized her eyes by holding a large white reflector just out of camera view to the right. The reflector added fill light to her face, but even more importantly created big beautiful highlights or "catchlights" to her eyes. When you first meet someone, the first thing you look at is their eyes. It's the first thing you look at when viewing a portrait as well. 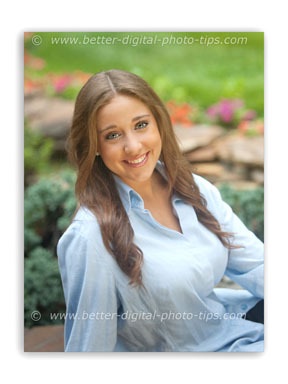 These 3 photography portraits are of high school seniors and are not close-up headshots. When we photograph people real close up, the eyes become even more important in the photo. It can be argued as well that with 3/4 or full length body posing, the eyes become less important as an element in the overall composition. So remember that you can control the impact and emphasize the eyes have on a portrait by composition lighting and perspective. One more tip to include in the group of photography portrait tips to use is to have your subject include something in the photo that is important to them. 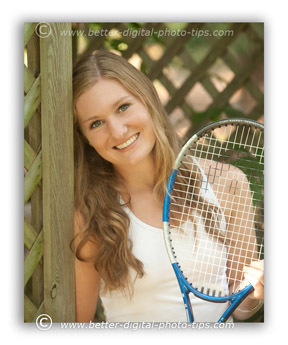 This young lady has a passion for playing tennis, so we included her racket in several of her poses. This is just one article of many on how to photograph people and I must confess that I am excited to bring you many more and help you elevate your level of photography. Here are many more links to articles involving photography portrait tips here: Portrait Photography Tips.